Perhaps it was because we had been drifting that we were chosen for the mission on the Sierra Buttes. When we first arrived at Lake of the Woods in the Tahoe National Forest and pushed off in our raft, we paddled across and around the small body of water. But after a while we tucked away the paddles and drifted. Lake of the Woods is the perfect place to believe that you don’t have a care in the world. Most of the time it is as slick as cobalt glass. Above us eagles soared. One folded its wings and dove for a duckling but a Wood Duck with a plucky red crown beat the eagle with its wings until the bird-of-prey retreated into a spruce, where it waited and watched and later settled for the solemn capture of a small pink trout. One day after we dove from the raft and swam and toweled off, I suggested to my husband that we should see at least one new landmark during our stay in the Tahoe National Forest. 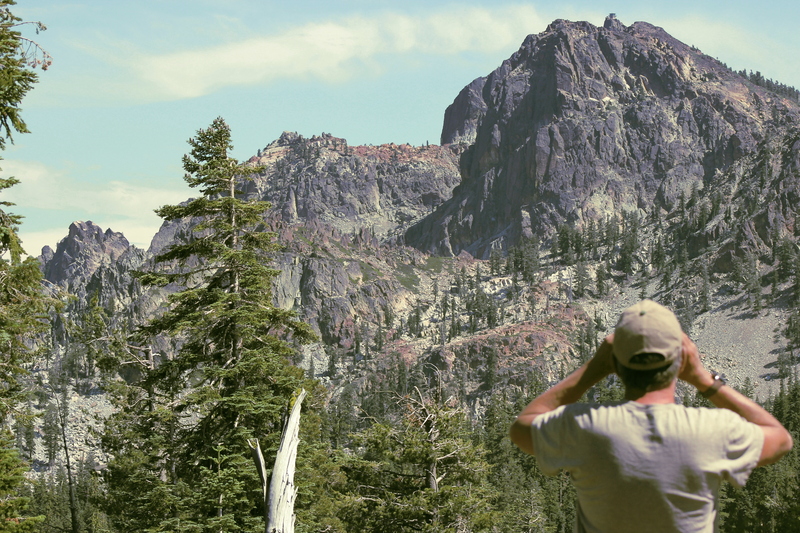 I recommended the Sierra Buttes for its elevation and proximity to the Lake. I thought we might make the trip on his birthday. We kept the option open when we drove into Truckee Monday to purchase supplies and enjoy a celebratory lunch of Ahi burgers from Burger Me. It was too hot to drive to the shadeless Buttes so instead we ferried dust clouds along the unpopulated miles from 450 to 650, past Bear Valley Campground toward Sierraville. We decided to explore Dark Canyon because it sounded shady but the slanting sun scorched rotund hills, crisping golden grasses. Boulders erupted through an inclined road, slowing us to a crawl, depriving of us even the artificial breeze we had gained from our earlier speed. Irritated by the heat, we stopped to pull a couple of waters from the refrigerator, just as two juvenile coyotes reticently strode from the shade of a solitary tree. When they loped toward the sun, I felt guilty for disturbing them. We were headed away from base camp so we reversed and caught 540 outside Sierraville, then caught 15 for the bumpy ride to 12 and back to the Lake. 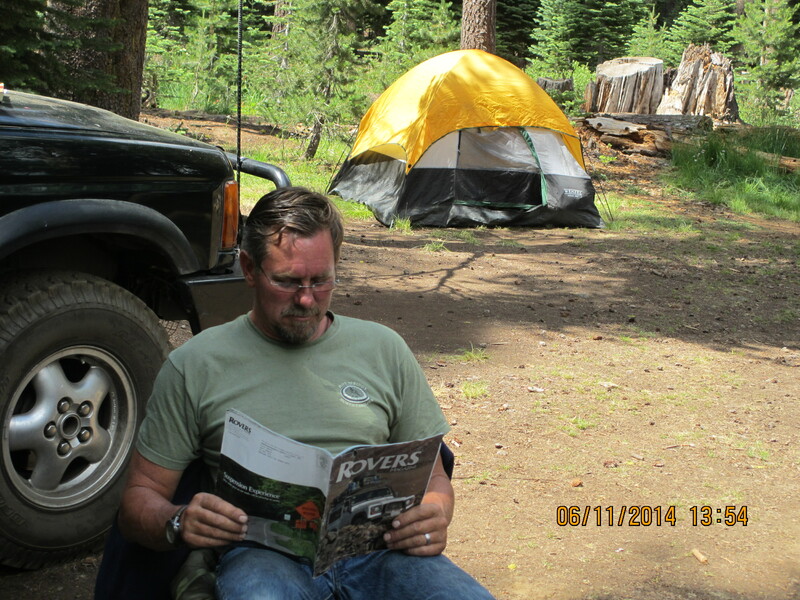 The next morning, I suggested that we start making our way to the Sierra Buttes. In truth, I felt there was no alternative to the plan. A gentle urging like a tide seemed to buoy me toward the Buttes. We packed everything we would need for an overnight in case the Land Rover broke down. Later Jeff would tell me that he considered off-loading the final 5-gallon water jug to lighten our load but decided against it. We jogged over 49 to Sierra City where we discovered Bassett’s, a tiny motel with a single gas pump, store and café. I was hungry and Jeff wanted to share lunch so I climbed the stairs to the restaurant, swung open the screen door and stepped inside Bassett’s where I eyed the possibilities of ham and cheese, a burger with fries. The counter was immaculate and the pine booths held a polished shine. I struggled to focus on the menu. I felt myself drifting and heard a voice saying, we didn’t have time for lunch. Confused, I looked around. There was no one ahead of me whose order might delay ours. It was 2:20. We still had plenty of daylight. We weren’t that far from the Buttes. I turned and walked out. I climbed into the Land Rover. “Oh.” It was unusual that I did not return with something. We wound past signs for Packer Lake and up to the last passenger vehicle parking lot. There we found a visible hiking trail but Jeff wanted to wheel so we continued on to a trail marked OHV only. After we skidded backwards down a portion of the hill, Jeff released air from the tires to gain traction. He continued to air down and gear down as the trail progressed. Our main obstacles were two miles of steep grade with alternating boulders and deep ruts that, when the wheels hit them, spewed silt. Again and again the engine whined. The wheels spun and clutched. Dust enveloped the Land Rover. Then Jeff guided the Land Rover over a final boulder and abruptly we arrived. No one else appeared to have chosen this route today. We prepared to enjoy a hike up to the Buttes overlook. Then a hiker appeared from seemingly out of nowhere. He was tan and slim, wearing lose pants and a wide-brimmed hat. He passed us as if with purpose, as if destined for the peaks. He wandered back. He asked about the drive up, whether it was hard. We said it was. We thought he was just making conversation. He seemed to set off, then circle back again. Maybe he was gearing up for the final push? Maybe he was lonely? Then he alluded to group of hikers with him–he said they didn’t have enough water. “Do you need water? We have water.” My husband pulled sleeping bags, a compressor, a camp stove and a backpack off the refrigerator. Relay-style, we conveyed four bottles of chilled water into the hands of the stranger as I related to him how, many decades ago, I found myself inadequately supplied with water for a Yosemite hike. I was with a friend and her young daughter. Also on that trail was a man from Israel who carried three gallons of water. The Israeli was strong enough to hike much faster than us but when he realized my friends and I had run out of water, he slowed and rested often, waiting for us to catch up so he could offer us a drink. The hiker thanked my husband and me and hurried off. The hiker disappeared and reemerged from the nearby bushes with a woman and four girls. We made introductions. H., the girl who struggled, was able to form words but emitted them slowly, as if through oatmeal instead of air. The heat-bred scarlet of her cheeks and forehead bled onto her scalp beneath her fine blond hair. “Do you need more water?” my husband asked the woman, Tanya. She showed us the tiny amount they had left in one camelback, which she planned to ration on their hike back down the trail. My husband pulled out our five-gallon jug and refilled all the camelbacks. We all stood in a circle and held hands and Tim offered a prayer in the name of our Lord Jesus Christ. Afterward Tim and Tanya told us they had been praying for help when we appeared. Tim and H. got into the back seat of the Land Rover. Tanya and I hugged before she set off with the remaining girls. To our amazement, the ride to the lower parking lot was as smooth as the lake. It was almost as if we were drifting. Oh Vivian. Bless you, bless God. He was surely speaking to you and guiding you. It is never a coincidence to be in the right place at the right time, and your gentle spirit was receptive to His voice of Love. Thank you for listening – thank you for sharing your testimony. I don’t think it was unwitting Vivian. I think you daily prepare your heart to be receptive and willing. What a beautiful post Vivian. They were fortunate that you and your husband were in the right place at the right time. Beautiful pictures of the Buttes. It’s been a few years since I was there. Thank you Tim. We were all blessed by these events, it was easy for me to imagine their strife and their relief, having been in similar circumstances many years ago. Delighted that you enjoyed the photos of the Buttes, it is a majestic place, I’m looking forward to a return visit. p.s. Glad you got your trailer safely out of the fire zone! God has guided and sent you to that place where you are needed the most. Thank you for being there. There is no question that we were Divinely guided to be at the Sierra Buttes at the appointed time. It is a humbling realization, in retrospect, to understand how precisely God prepared and instructed us. So cool Vivian! We just need to listen and respond…. Thanks for looking in on us Roberta! I think it really helped to be in such a relaxed state…I was extremely grateful to be used by God for this purpose. I love your blog. I too find the desert to be a deeply spiritual place and look forward to your posts. You are living the life that I dream I will be able too in the future. Was wondering if you have a Flickr account/group? I will say again here, that you and Jeff have the biggest of hearts that God ever made! And Sierra Buttes sounds like an amazing to camp in and go for a hike. Just the names are magical- The Lake of the Woods, the Dark Canyon. I am glad you had an amazing time. PS. nice to know you’re using a Land Rover!!!! What a wonderful story, Vivian. I wonder how many tragedies would have been averted if more people listened to God’s nudges like you did. May we all have hearts to hear and obey. p.s. Your kind reference to Steinbeck has made me smile. Dear Jocelyne, I apologize for taking so long to reply to your note. My lapse does not accurately reflect how delighted I was that you visited my blog and took the time to write me. I have limited time these days and have been working a new post which I wanted dearly to complete. With that accomplished, I now turn my full attention to you. Blogging is one of those activities in life where one comes across jewels and you, my dear, are one of those. From time to time, you enter my mind and I wonder, to what new and beautiful creations are you attending? Ohh you’re so kind, you touched my heart dear Vivian. I can say the same about you. You are one of my very favourite blog and each time I visit I can truly feel your kindness and loving heart, and the love and presence of God too. I don’t have much time for my blog right now but Iately I did a portrait session and of course I continue to photograph landscapes and country life. I hope I can find more time soon to post more often.